In looking through my ancient issues of Stampin' Success, the publication Stampin' Up! 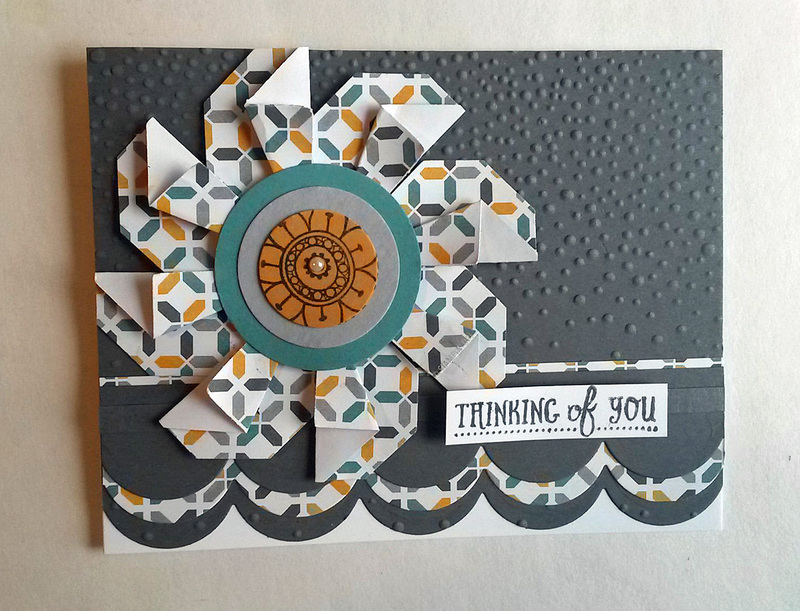 demonstrators are lucky to receive, I came across a project that I thought could be made into an adorable card. The issue, from 2008!, has an article entitled "Punch It Up". Of course, it requires punches that were current product at that time, but have since been retired. As a devoted aficionado of almost everything I've ever purchased from Stampin' Up!, and since I am very reluctant to give anything up, I, of course, still had on hand the punches the article requires. If you'd like to give this project a try, maybe you too still have your Tag Punch? If so, grab it! If not, there are lots of punches and dies on the market now that would work equally as well. Maybe the shape would be a bit different, but it would still work. The punch I used measures 1 3/4" tall by 1 3/8" wide. I do apologize that my flower is created from retired Designer Series Paper. You see, I wasn't sure how it was all going to work, so I just grabbed something to give it a try. It turned out so cute that I decided to go ahead and use it on my card. I hope you don't mind. 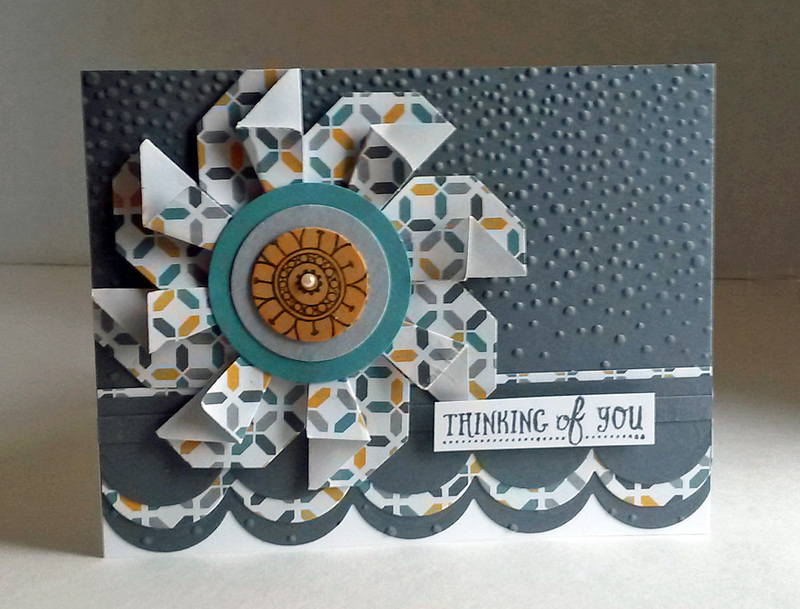 There actually is a lot of current product at work in this card: the Basic Gray cardstock, the Whisper White cardstock, the Softly Falling embossing folder (page 211), the sentiment from Basket of Wishes (page 125), the center of the flower from the Hello Color set (page 168), the scallop edge die from the Seasonal Layers Thinlits (page 216), and, of course, the pearls on page 197. The following photos merely show various angles of the Pinwheel Petal flower. This next photo shows just how cute the small flower from Hello Color is as the center of a larger flower. 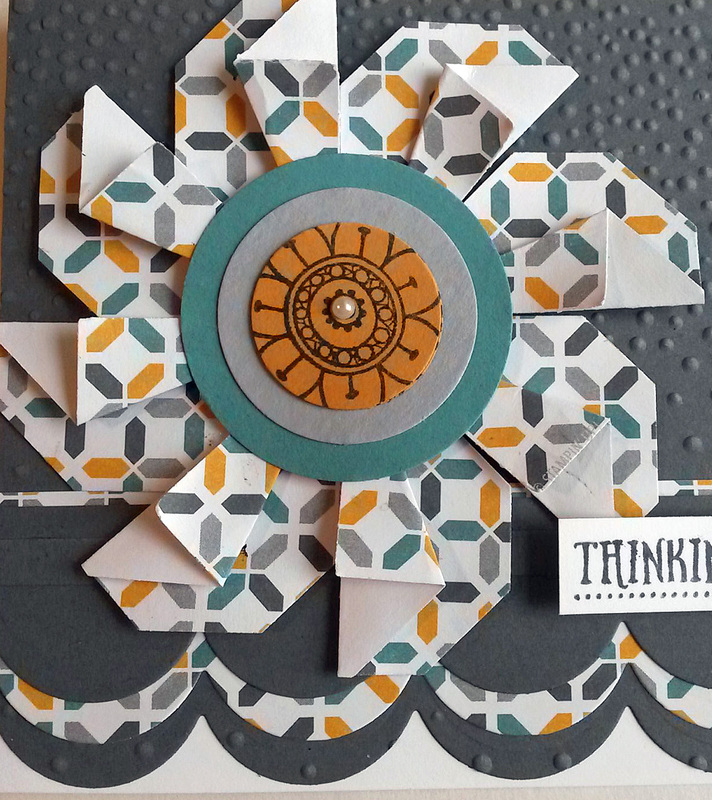 The flower is not perfectly centered, thus the little bit of lopsidedness when punched with a circle punch. 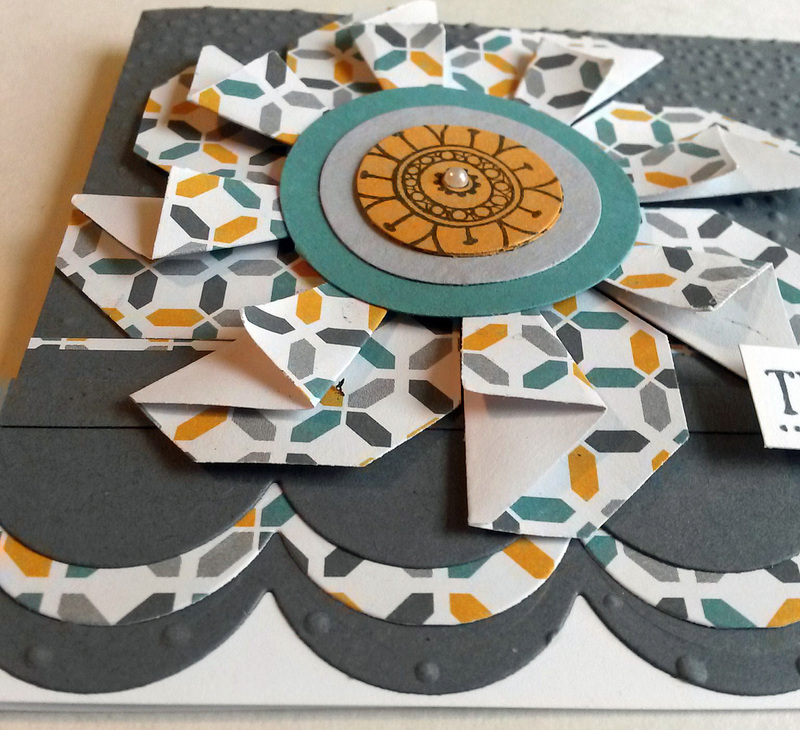 Before I added the embossed dots on the Basic Gray background with the Softly Falling embossing folder, the card was quite boring. This little bit of dimension adds a perfect punch of interest. Finally, fold the top layer back so the original bottom edge of the tag lines up with the folded edge. (the last photo) Looking at all three of the pictures, can you visualize that? 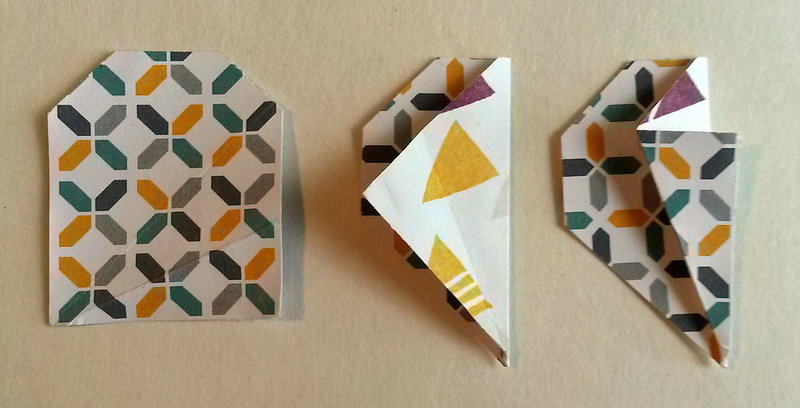 Once that second fold is made, you have now completed one petal. 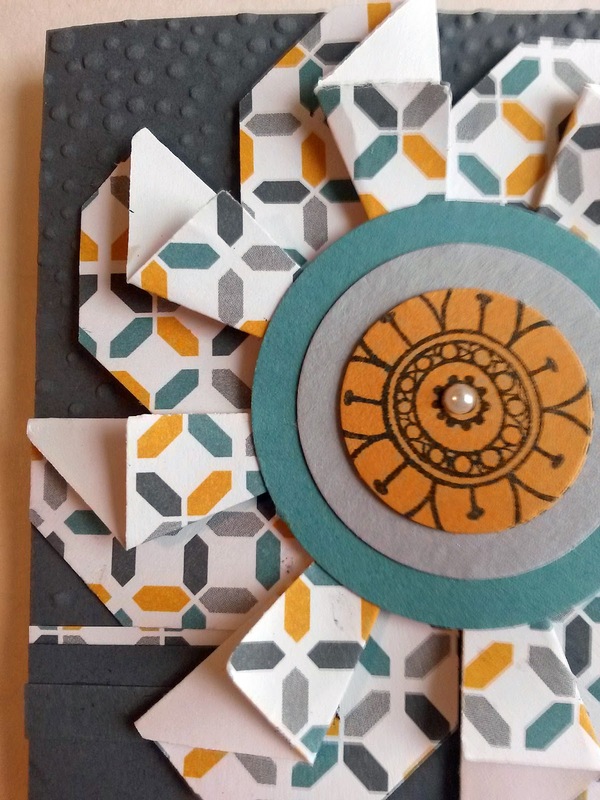 To make a flower like the one on my card, you need to make eight of these petals. To build the flower, start with a circle punched with the 1 3/4" Circle Punch. I found the center of the circle to start the first petal, and, if the petals are lined up against one another, it should come out perfectly. Once this is put together, this will be the back of the flower. 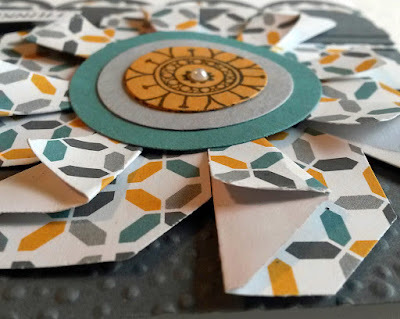 The front center of the flower can be built up, first starting with another 1 3/4" circle, then adding layers as desired. Here is a little awareness scenario for you: Look at my completed flower in the photo below, and note that the inside folded edge -- which is the reverse side of this DSP -- is completely white. Now, look at my photos above. See that annoying burgundy piece interfering with my pristine white? As I was making my petals, I noticed that this happened on three of my petals. And that bothered me. Thus, I ended up punching and folding 11 petals for my 8-petal card so that the inside of each of them was pure white. That's OK. They were good to use for my pictorial instructions. Right? Does it bother you that I use retired product at times in my blog posts? I just love all my goodies so much that I really need to play with them! 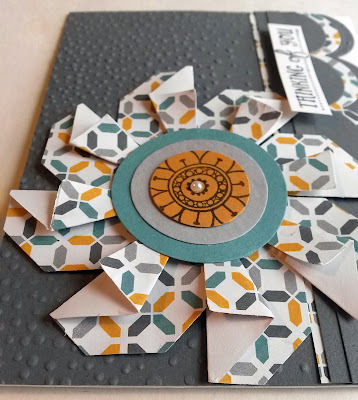 If you don't own the actual products that I am using, there are so many current items available through Stampin' Up! that would work similarly in each of my projects. Since I can't afford to replace things that I already have, I can't always feature current product in my posts. I simply present my projects as a starting point, as an inspiration, enticing you to try these technique with other options if you need to, and make them your own! 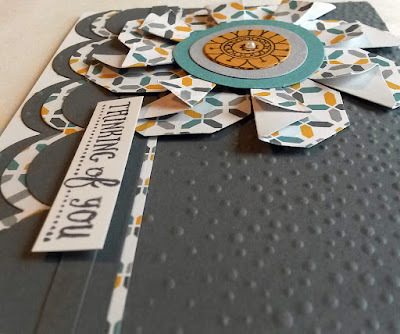 As always, if you would like to purchase Stampin' Up! product through me, just click on the Shop Now button, either at the top under my header or on the right side. This is really a great idea! I love the colors of this one too. Thanks for sharing with us! So pretty, I love the layers and texture you achieved. 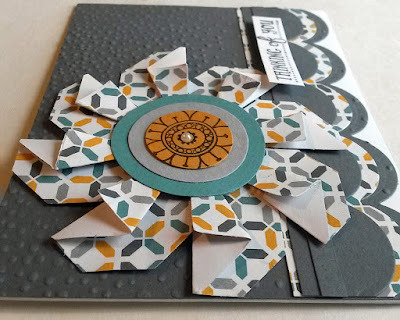 Linda, This is such a pretty card! From the colors to the pinwheel, just fabulous! Pinned. 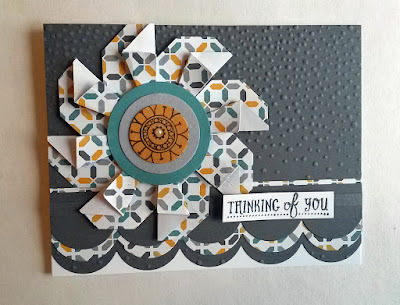 You always make the most lovely paper crafts, Linda! It's super cute! I'm sure you're happy that you had hung on to the punches!! Thanks for sharing with SYC. I don't mind if you share stuff with retired products. 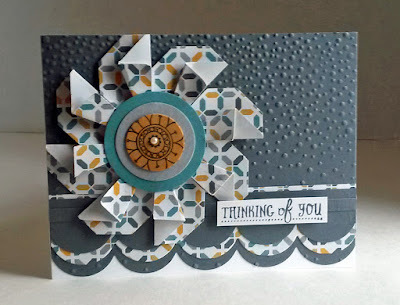 I love my stampin' up watercolor crayons!! Thanks for sharing at #HomeMattersParty hope you will join us again this week! !